Usual postal services, together with an off-licence, a good selection of newspapers and magazines, sweets, drinks, ice creams, gifts, etc. They stock a range of frozen foods, grocery items, maps, books, stationery, etc. Personal Banking Services (cash withdrawals, cheque/cash deposits, etc.) are available to customers of certain banks, e.g. Smile, Cahoot, The Co-Op, etc. Delicious light lunches, home baking, teas/coffees, Skye ales, Thistly Cross ciders, Isle of Skye ice cream, soup, baguettes. Everything is freshly made. Free wi-fi. See Café Lephin Facebook Page for current opening times. Deservedly popular restaurant, open Mar-December, 7days. Very high quality, mainly traditional Scottish cuisine. Large A la Carte & children's menu. Small vegetarian menu. Disabled & baby-changing facilities. For more details visit the Old School web-site or telephone (01470) 521421. Portree has all of the Island's main shops: chemist, large Co-Op Supermarket and smaller Safeway, gift shops, banks, cinema / theatre, restaurants, take-aways, etc. The Aros Centre on the outskirts of Portree is worth a visit for its RSPB Sea Eagle information centre, with live video footage from a Sea Eagle nest and a Heronry. Dunvegan has an excellent grocers, The Fruit & Nut, a newsagents / village shop, mini market, bakery, hotels, restaurants, fishing tackle/bait shop. 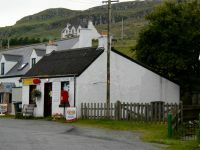 The nearest cash-point is located inside the Fasgadh mini-market (£1.50 charge per withdrawal). The closest petrol station and garage services are also located in Dunvegan. Recently opened patisserie, Jann's Cakes, sells hand-made cakes, chocolates, breads, sweets, take-away soups and coffees. They certainly aren't cheap but the quality is superb. There is a well-attended service at 10:30am on Sundays. Award-winning, top-quality cuisine. The premier restaurant on Skye but expect to pay premier league prices too (around £150 for dinner for two, with wine). It is consistently ranked among the top 100 restaurants in the UK by Restaurant magazine. 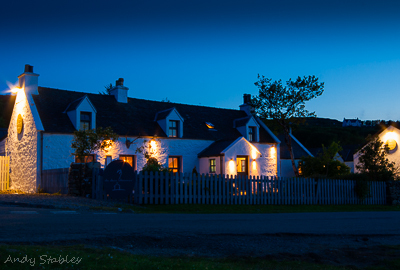 Fresh Skye seafood is a speciality but lamb, beef, game and a vegetarian option are also on offer. The wine list is extensive and carefully compiled. Open, for Lunch or Dinner, but closed Sunday lunch. Closed at lunchtimes during the Winter months and closed in December and January. For more information visit the Three Chimneys own Web-Site. Tel: (01470) 511258. 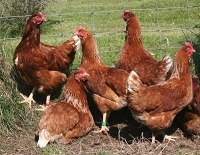 Glendale's premier supplier of free-range eggs to both locals and holiday-makers alike, with a fully-registered flock of over 40 happy hens that are free-to-roam and lay the most delicious eggs with rich, orange yolks. They grow and sell a wide range of salads, herbs and vegetables at supermarket prices that are picked freshly to order. Varieties are chosen for maximum flavour and grown using traditional methods, using only organically approved pest controls and fertilised with seaweed gathered at the shore. Pre-orders taken from holiday-makers coming to local self-catering cottages. Telephone: (01470) 511354 or see them on Facebook. You will find a number of croft houses in Glendale selling high-quality, fresh, seasonal, local produce from road-side boxes, including free-range eggs, jams, pickles, chutneys, salads, vegetables and herbs. These taste sensational and are well worth seeking out if you are staying locally or passing through en route to Neist Point.